The scar tissue creates a barrier for growing nerve cells in spinal cord injuries. 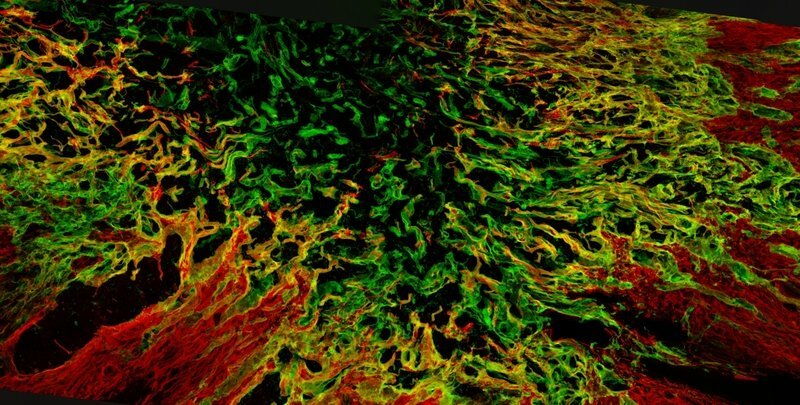 Scientists have now found a way to render this cell wall more permeable for regenerating nerve cells. Paraplegia. This is often the long-lasting result, when nerve fibers have been crushed or cut in the spinal cord. In contrast, for example, to the nerves in a cut finger, the injured nerve cells in the central nervous system (CNS) won’t regrow. Scientists have been working for decades to discover the reasons for this discrepancy in the regeneration abilities of nerve cells. They have found a variety of factors that prevent the regeneration of CNS nerve cells. One by one a number of substances that act like stop signs and halt the resumption of growth have been discovered. Other obstacles lie within the cells: The microtubules, small protein tubes which compose the cells’ cytoskeleton, are completely jumbled in an injured CNS nerve cell. A structured growth becomes impossible. In addition to this, the lost tissue is progressively replaced by scar tissue creating a barrier for growing nerve cells. Frank Bradke and his team at the Max Planck Institute of Neurobiology in Martinsried study the mechanisms inside CNS nerve cells responsible for stopping their growth: “We try to provoke the cells to ignore the stop signs so that they regrow.” For this task, the neurobiologists have focused on studying the role of microtubules. These protein tubes have a parallel arrangement in the tip of growing nerve cells, stabilizing cells and actively pushing the cell end forward. This arrangement is lost in injured CNS cells. So how can the order of the microtubule be kept or regained in these cells? And once the cells start growing, how can they overcome the barrier of the scar tissue? Together with their colleagues from the United States and the Netherlands, the Max Planck scientists have now found a common solution for both problems. Taxol, the trade name of a drug currently used for cancer treatment, has now been shown to promote regeneration of injured CNS-nerve cells. The scientists report in the online issue of the journal Science that Taxol promotes regeneration of injured CNS-nerve cells in two ways: Taxol stabilizes the microtubules so that their order is maintained and the injured nerve cells regain their ability to grow. In addition, Taxol prevents the production of an inhibitory substance in the scar tissue. The scar tissue, though reduced by Taxol, will still develop at the site of injury and can thus carry out its protective function. Yet growing nerve cells are now better able to cross this barrier. “This is literally a small breakthrough”, says Bradke.